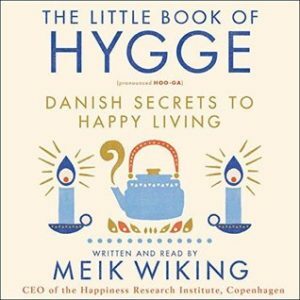 I first saw this book when JoAnn reviewed it, and I thought I’d like learning more about Hygge. I put a hold on it at my library but was #6 in line and didn’t want to wait so I bought the audio version. I really enjoyed this short book. I learned that I’ve been living a Hygge life for most of my life. How do I Hygge? Every day I curl up on the sofa and cover up with a soft throw, I light candles, the rooms of my house are barely lit when there’s no company. I spend as much time as I can with family, just talking or playing games, mainly just enjoying each other’s company. I love walks on the beach, along the river, or at the park. Riding the nearby trials on my bike. Burning incense, adult coloring books, romantic movies or listening to soft music. I bet there are ways you Hygge too, you just didn’t know it. I really enjoyed listening to this book, the author did a really good job of narrating it. I recommend this book to everyone. We all need Hygge in our lives. I think I need more Hygge in my life. I need to check this out.
! I’m always looking for new ways to Hygge! You’re right – we DO need hygge in our lives. I’m partial to candles and throws! Glad you liked this book, though I didn’t know there was an audio version. The print edition had some cute illustrations. I saw that when I read your review but I’m hooked on audio this year. I might get a copy from the library to see the illustrations, I hope the wait list isn’t still long. I hope you enjoy the book and I’d love to read your thoughts. Sounds like it offers some great ways to add hygge to a reader’s life! It does, I really enjoyed it. Age is a state of mind. I just turned 60 but my mind thinks I’m still young. I was thinking about getting the audio of this one but after reading your review I think the print version would work better for me. I could definitely use a little more Hygge in my life! I hope you enjoy it Katherine. Thank you, I think I need more Hygge in my life too. Just need to find time for this 🙂 I think I’ll search internet to find out more about Hygge or even order the book. Thank you again. You’re welcome, and I hope if you do get the book or do an internet search for more info that you find a lot of ways to add Hygee to your life!